On a Saturday morning, I usually take Owen to the Ready Steady Riders Super Saturday Strider session at Birmingham BMX track. However this weekend he had been invited to a birthday party, which gave me the day free to get out on my bike. The timing was great for me, as I was still yet to visit a trail centre or pump track in March, and I am trying to visit both every month. In fact, my last proper ride was at Flyup 417 Bike Park, almost two months ago! I have been trying to get back to the Forest of Dean for quite a while now, but something always seemed to get in the way. However it was worth the wait, as the weather was spot on – sunny, but not too warm! It seems like 30th March is a good day for bike rides, as I also had a good day at Llandegla in 2018. The first thing that struck me when I got to the Cannop Cycle Centre was how many little rippers there were! Children all over the place on bikes, such a positive sight! I started with a quick lap of the pump track before joining the Verderers Trail, an eleven kilometre blue graded trail, that I last rode in 2015. I like that it is mostly single track, including the climbs, which are more interesting than slogging up a fireroad. The highlight of the trail is the final descent, called Dragon’s Tail. There are two lines on the descent. I took the blue line, as it was closed on my previous visit, so I had already ridden the red line. The first section, before the trails split, was a long line of slightly rocky rollers, perfectly judged for a blue trail. The berms start after the split, zig zagging down the hill until rejoining the red line for a few final big berms, before a gentle roll back to the car park. In my rush to get out of the house I had forgotten both my wallet and my bike lock, so I was relieved to see a shack selling coffees and pizza slices in the seating area by the cafe, especially as I had just enough loose change for a slice of pizza! As I sat in the sun, enjoying my pizza, watching all the little rippers, I thought how good it will be when Owen and Henry (and Jen!) can come mountain biking with me! After lunch I was torn between doing another lap of the Verderes trail, or doing the first section of the red graded Freeminers trail, then into the “easy” rated Launch Pad trail in the bike park, which my friend Abby has recommended. I decided to do the red trail, for a change, thinking that if I had enough time after I could fit in another lap of the Verderers. The Freeminers trail is more natural than the surfaced blue trail, with plenty of roots and off camber sections to keep you on your toes. Thanks to the recent good weather, the trail was running well – I could see it being a hard slog in the wet! The trail snaked up hill until arriving at a jump line, it felt strange having jumps in the middle of the wood, but at least nobody was there to see my pathetic attempts to clear them! After losing altitude on the jump line it was another single track climb back up to almost the top of the hill. The next trail feature was a drop off, in to a narrow single track descent, something that I probably would have walked around twelve months ago, but I sent it, actually finding the narrow trail through the trees more difficult than the drop. Unfortunately this meant another slog back up the hill. I eventually emerged on to the fire road and pedalled round to Launch Pad. Before dropping in, I stopped for a Creme Egg that I had been carrying around in my rucksack. Bikes, pizza and Creme Egg – what a day! Launch Pad was fast, wide and smooth, with jumps and big berms. I found it easier to ride than Dragon’s Tail, which meant I hit it a lot faster. It was so much fun – one I will be riding again in the future! This short loop took me about an hour, meaning I had run out of time for another lap of either the Verderers trail or Freeminers/Launch Pad. Since getting home I realised that I could have done another run down Launch Pad if I had ridden up the fire road. However I had time to explore the trails around the car park, so retraced my route from the morning along the start of the Verderers trail, until it passed the Freeminers extension, which I rode back to the car park. As I still had a short amount of time before needing to head home I decided to check out the skills loop. It was too basic for me, although I can see how it would be good for kids looking to progress to the blue trails. Next I went back to the pump track, to try and make up for missing my March pump track session. 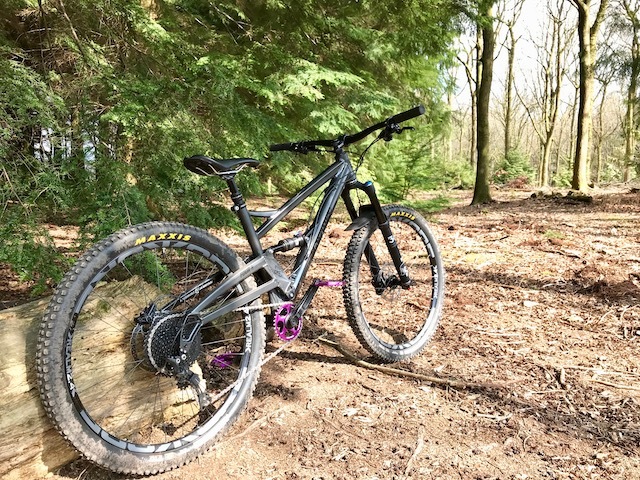 I did three laps and was surprised that it felt a lot easier to gain speed on my full suspension Orange Four, than on my hardtail. Something I need to investigate further! Next to the pump track was a skills area, two mini downhill trails, one with drops and one with tabletop jumps. Both of these are skills I need to work on, so I decided to check them out. I hit the drops line first, taking the smaller of each of the drops – there was no way I would be hitting the road gap drop! I surprised myself with how well I coped with the drops. On my next run I hit the jumps line, although I mostly rolled over the jumps. The sign at the bottom of the trail seemed to indicate that the area could be closed for training, so I think I will go back to the Forest of Dean if/when I decide to do a jumps and drops course, as this little area looked perfect. Before I left I had a quick look around the shop, I was pleased to see lots of kit for mini mountain bikers! It was a great reflection of the whole place, as a great place to ride bikes with children! It is certainly somewhere I look forward to riding with Owen and Henry in the future!